γ-Herpesviruses (γ-HVs) establish life-long persistency in their host. Infection of mice with γ-HV68 provides a genetically tractable in vivo model for the characterization of the lifecycle/pathogenesis of γHVs. This protocol describes the detection and quantitation of γHV68 infection at acute and latent stages following infection by plaque-forming, infectious center, and qPCR assays. Pirooz, S. D., Lee, J., Zhao, Z., Ni, D., Oh, S., Liang, C. Measurement of γHV68 Infection in Mice. J. Vis. Exp. (57), e3472, doi:10.3791/3472 (2011). γ-Herpesviruses (γ-HVs) are notable for their ability to establish latent infections of lymphoid cells1. The narrow host range of human γ-HVs, such as EBV and KSHV, has severely hindered detailed pathogenic studies. Murine γ-herpesvirus 68 (γHV68) shares extensive genetic and biological similarities with human γ-HVs and is a natural pathogen of murid rodents2. As such, evaluation of γHV68 infection of mice inbred strains at different stages of viral infection provides an important model for understanding viral lifecycle and pathogenesis during γ-HVs infection. Upon intranasal inoculation, γHV68 infection results in acute viremia in the lung that is later resolved into a latent infection of splenocytes and other cells, which may be reactivated throughout the life of the host3,4. In this protocol, we will describe how to use the plaque assay to assess infectious virus titer in the lung homogenates on Vero cell monolayers at the early stage (5 - 7 days) of post-intranasal infection (dpi). While acute infection is largely cleared 2 - 3 weeks postinfection, a latent infection of γHV68 is established around 14 dpi and maintained later on in the spleen of the mice. Latent infection usually affects a very small population of cells in the infected tissues, whereby the virus stays dormant and shuts off most of its gene expression. Latently-infected splenocytes spontaneously reactivate virus upon explanting into tissue culture, which can be recapitulated by an infectious center (IC) assay to determine the viral latent load. To further estimate the amount of viral genome copies in the acutely and/or latently infected tissues, quantitative real-time PCR (qPCR) is used for its maximal sensitivity and accuracy. The combined analyses of the results of qPCR and plaque assay, and/or IC assay will reveal the spatiotemporal profiles of viral replication and infectivity in vivo. The following protocol will describe the study of virus titers and viral genome loads in the lytic and latent infection cycle of γHV68 in mice, which can theoretically be used to evaluate infection by other viruses sharing similar lifestyle to that of γHV68. Thaw a frozen vial of γHV68 in 37 °C water bath. Add viral inoculums to NIH3T12 or 3T3 cell culture (~50% confluency) in 10 cm dishes and culture the infected cells at 37 °C in 5% CO2. Examine the culture by microscopy for cytopathic effect (CPE) and collect the media at a time when greater than 80% of cells show CPE 4 ~5 days after infection. To maximize the yield of virus, the infected cell culture can be frozen-and-thawed twice to release all cell-associated γHV68. Centrifuge the collected media at 1000 rpm for 5 min at room temperature (RT) to remove cell debris. Carefully transfer the supernatants to new tubes (high-speed centrifuge tube) without touching the cell debris at the bottom. High-speed centrifuge at 12,000 rpm (for Sorvall SA-600) at 4 °C for at least 1.5 hrs to concentrate viral particles. Discard the supernatants into 10γ bleach solution and carefully re-suspend the pellet (virus and residual cell debris) with 1ml serum-free DMEM. Transfer the re-suspended pellet into a 1.5 ml micro-centrifuge tube and mix well by vortexing. Centrifuge for 2 min at maximum speed to remove residual cell debris and transfer the supernatant (virus stock) to a new tube. This is the final viral stock for infection. The titer of the virus stock is determined by plaque assay (see below). Infect mice at ~6 weeks of age with 1,000 ~5,000 plaque-forming units (PFU) of γHV68 per mice. Anesthetize mice by injection of ketamine/xylazine (60 μl/mouse of a mixture of 80 mg/ml ketamine and 12 mg/ml xylazine) into peritoneal cavity. Monitor anesthesia by pinching the mice toe. It usually takes ~5-10 min. If mice are not fully anesthetized, they will sneeze the virus. When the mouse is fully anesthetized, use a pipette to inoculate ~30 μl of PBS containing γHV68 (15 μl at each nostril) to mice drop-by-drop slowly but steadily. Be sure the mouse is indeed inhaling the drops without trying to form bubbles. Allow the mouse to recover for 10-15 min and monitor the welfare of the mice (e.g. consciousness, breathing, etc) before returning them to the cage. Animals are checked daily for illness and adequacy of food, water, and bedding conditions. If clinical signs of illness, pain or distress develop, routine diagnostics to determine the etiology will be conducted. Animals that lose more than 20% of their body weight will be recorded for maximum weight loss and euthanized. The final decision to perform euthanasia is at the discretion of the clinical veterinarian and is made following consultation with the principal investigator. Virus infectivity titers are determined by the plaque formation on monolayers of Vero cells. Vero cells are seeded at 2.5x104 cells/well in 12 well-plates the day before plaque assay. The cells should be evenly distributed and the cell density should reach 30 - 40% on the day of plaque assay. Prepare 0.5% (w/v) methylcellulose (MC) overlay medium (Table 1). Sacrifice γHV68-infected mice 5-7 days after intranasal infection to determine acute-phase virus titers in the lungs. For euthanization Ketamine HCl (80-100 mg/kg SC, IM, IP) will be administrated IM followed by intravenous overdose of Na pentobarbital (30-50 mg/kg IP). This method is approved by the American Veterinary Medical Association. Harvest the lungs and rinse twice with 1 x PBS to remove blood cells. Collect one-side of the lungs in 1 ml ice-cold complete DMEM medium and keep on ice. Rapidly freeze the other side of the lungs and store at -80°C for examining viral DNA loads in the lungs by qPCR (see below). Use a tissue homogenizer to homogenize lung tissues at maximum speed for 1 sec, freeze-and-thaw three times. Wash the homogenizer with 70% ethanol at every step when changing the sample. Centrifuge the homogenized tissue at 3,000 rpm for 10 min at 4 °C. Collect the supernatant and transfer to new tubes for plaque assay. Prepare serial dilutions (usually from 10° to 10-8) of lung homogenate samples in 1.5 ml micro-centrifuge tubes with plain DMEM by vortex. Prefill the appropriate number of tubes with 540 μl DMEM and dilute 60 μl homogenate into the first tube. Transfer 60 μl from the first tube into the next one, and so on. Aspirate media from the prepared Vero monolayers in the 12-well plates and load 200 μl/well serially diluted homogenate containing infectious viruses in a reverse order (from 10-8 to 10°). Use two wells for each titration (in duplicate). Incubate Vero cells with the virus inoculums 1 hr at 37 °C. Gently swirl the plates every 15 minutes to evenly distribute the virus over the monolayer. Remove the inoculums and replace it with 2 ml/well of the overlay medium (Table 1). Incubate the plates for one week at 37 °C. Remove overlay medium (does not need to be complete) and replace with the fix/stain medium of plaque assay (Table 1) and incubate for at least 1 hr at RT. When the plates are dried, count the number of well-isolated plaques at each dilution. To minimize error, only the wells containing between 10 and 100 plaques are counted. Calculate the virus titer using the following formula: titer (pfu/ml) = [(number of plaques/well)/(volume of inoculums/well)] x dilution factor. Viral latent load is determined by infectious center (IC) assay on the monolayer of Vero cells. The day before IC assay, seed Vero cells in 6-well plates (1 - 2.5 X 105 cells/well. We usually use 11 wells per spleen sample, 10 wells will be used for the serially diluted splenocytes suspension and one well for testing spontaneous reactivation of the virus after freeze-thaw cycles. Sacrifice the infected mice after latency is established (12 - 14 days after infection). Harvest the mouse spleen and pool them into 1 ml chilled DMEM. Mechanical dissociation of mouse spleen. Transfer the freshly isolated mouse spleens into a 10 cm plate and add 10 ml of desired medium such as DMEM with 2% FBS. Wet two frosted-end glass microscope slides with ice-cold medium. Place the spleen on the frosted side of one slide and nick the capsule with the edge of the frosted end of the other slide. Mechanically dissociate the spleen between two slides until all red clumps are crushed (also remove fat particles if present). Rinse slides with DMEM to recover remaining cells on both slides. Transfer the entire tissue suspension gently through a cell strainer (40 μm nylon mesh) into a 50 ml conical screw-cap tube. Wash the 10 cm dish containing the spleen homogenates with 10 ml PBS and transfer while filtering. Centrifuge the single cell suspensions 10 min at 375 x g and discard supernatant. Flick the cell pellets to break up existing cell clumps. Add 5 ml ACK buffer (Table 1) to lyse the red blood cells. Incubate 5 min and centrifuge again at 375 x g.
Discard the supernatant and re-suspend the pellets, thoroughly, yet gently, in PBS with 2% FBS. Keep cells at 4 °C. Use a pipette to remove debris, if any. Count viable cells using an automatic cell counter (Bio-Rad). Prepare serial five-fold dilutions (i.e. 1/5, 1/25, 1/125, 1/250) of splenocytes suspension in duplicates. Prefill the 15 ml conical tubes with 2.4 ml DMEM and dilute 600 μl splenocytes suspension into the first tube and mix well. Transfer 600 μl from previous tube into the next tube, etc. Do not vortex! Aspirate the medium from the prepared 6-well monolayer of Vero cells. Seed 1 ml of the serially-diluted splenocytes onto Vero cells with each dilution duplicated (10 wells will be used for 0, 1/5, 1/25, 1/125, 1/250 dilutions). Incubate plates 8-12 hrs at 37 °C and 5% CO2. Do not exceed 24 hrs. Aspirate the seeded splenocytes suspension and load 4 ml overlay media (Table 1) to each well. Incubate for an additional 6 days. Determine the levels of spleen infectious centers by staining the plates with 0.2% (w/v) crystal violet as shown in plaque assay. Extract total genomic DNA from the γHV68-infected tissues, such as lung and spleen samples in this experiment. Use the DNeasy Blood & Tissue Kit (Qiagen), following the manufacturer′s protocol. Determine the DNA concentration of each sample to ensure the same amount of DNA being used for qPCR assay. Design the virus-specific primers (~200 bp amplicon is preferred for a qPCR assay). We used the γHV68 ORF56-specific primers (forward primer: 5′- GTAACTCGAGACTGAAACCTCGCAGAGGTCC - 3′; reverse primer: 5′-CCGAAGCTTGCACGGTGCAATGTGTCACAG-3′) for this assay and β-actin primers (forward primer: 5′-cacccacactgtggcccatcat-3′ reverse primer: 5′-gtgaggatcttcatgaggtagtc-3′) as a control for the qPCR reaction. Mix the DNA sample (100 - 500 ng is good) and appropriate primers with 2 x SYBR master mix (Bio-Rad iQ SYBR Green Supermix). Use the Bio-Rad Real-Time PCR System to quantify the viral load in the infected tissues. Perform PCR at the following condition: 95 °C for 15 min and 45 cycles of 95°C for 30 min, 60°C for 30 min, and 72°C for 30 min, followed by melting curve analyses, for both the viral and actin amplicons. To make a standard curve for the quantification of viral genomes, serially dilute known amounts of a γHV68 bacmid DNA with the genomic DNA isolated from uninfected cells. Run qPCR in parallel with the DNAs retrieved from the infected tissues using the same sets of virus-specific primers. Present the viral genome load in the tissues as viral DNA copy number per unit (e.g. 100 ng or 500 ng) of genomic DNA after actin normalization. Figure 1 depicts the overall scheme of the experiments for the measurement of γHV68 infection in mice in vivo. Representative results of virus titers in the lungs during acute infection of γHV68, as determined by plaque assay, were shown in Figure 2A. A mutant strain of γHV68 containing non-functional viral Bcl-2 (vBcl-2) replicated at levels comparable to wild-type γHV68 in the lungs after 7 days intranasal infection of BALB/c mice (6 - 7 mice per group). No statistically significant differences in the lung titers of the virus were detected between two groups. This data indicates that vBcl-2 is not a crucial factor for the acute infection of γHV68 in mice. However, by 28 days postinfection, the titer of vBcl-2 mutant virus in the spleens dropped 6- to 10- fold compared to the WT, as measured by infectious center assay (Figure 2B), suggesting that the vBcl-2 mutant γHV68 virus is defective in the maintenance of splenic latency after infection. In agreement with the reduced infectious center titers, the viral genome load of the vBcl-2 mutant virus was severely reduced compared to that of WT viruses at day 28 in repeated experiments, as shown in Figure 2C. The close correlation between viral genome loads and the frequency of latent-HV68vBcl-2 mutant virus reactivation ex vivo at latent stage of infection highlights a latency defect of this mutant virus infection. Figure 1. Schematic diagram for the measurement of γHV68 infection in mice by means of plaque formation, infectious center, and qPCR assays. Figure 2. Lytic and latent infection of the WT and mutant γHV68 viruses in vivo. 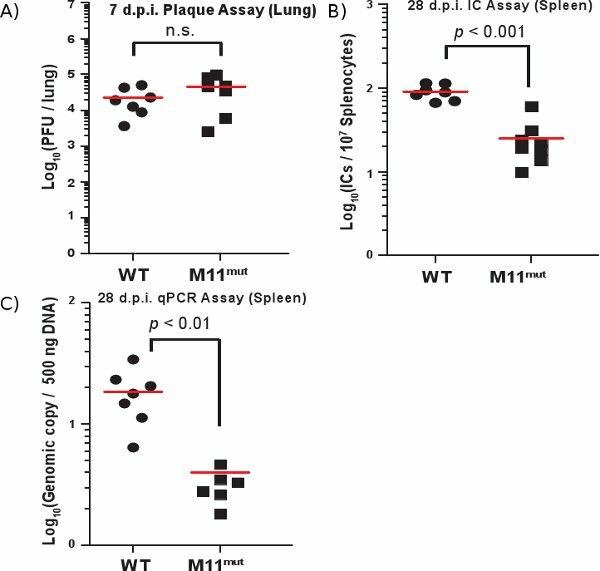 Acute replication (A) of the WT and mutant vBcl-2 γHV68 viruses in the lungs of the BALB/c mice at 7 dpi (day post infection) was determined by plaque assay. (B and C) Splenic infectious centers (B) and viral genome load (C) in the spleens of infected mice were measured at 28 dpi by infectious center assay and qPCR, respectively. Red lines, the averages of indicated values. n.s., not significant. γHV68 has been widely used as a model to understand the pathogenesis of human γ-HVs2,4,5. 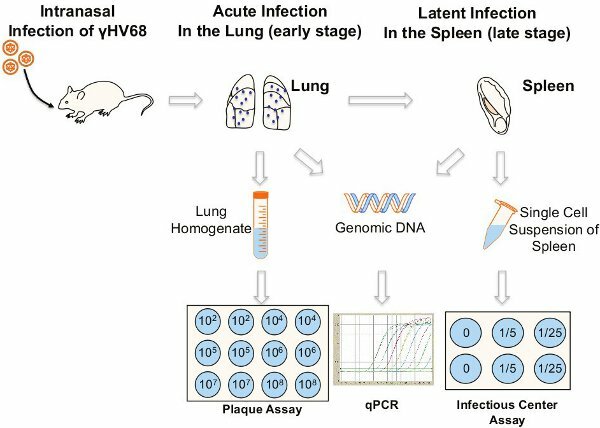 In this protocol, we described three routinely used methods, including plaque assay for infectious virus titer, IC assay for viral latent load, and qPCR for viral genome load, to evaluate the acute and latent infection of γHV68 after intranasal inoculation in mice. The plaque assay has been used extensively to determine the virus titer in infected cells or tissues, but the optimal conditions vary for the virus being used. This is largely because the capacity of different viruses to produce plaques (countable lesions) on a cell monolayer is different. γHV68 normally produces obvious plaques on the monolayer of monkey Vero cells or cultured mouse cells such as NIH3T12 or 3T3, 6 - 7 days after infection. Notably, the cell sensitivity to viral infection declines as the monolayer ages or becomes overcrowded Thus, we usually use less than 50% confluency of Vero cells for plaque assay, which, in our experience, demonstrates the best results for γHV68. In addition, an evenly distributed and freshly-made monolayer is highly recommended for the accuracy of plaque counting. While making the serial dilution of the virus samples, caution must be taken to avoid bubbles and pipet tips should be changed between each titration. For high-titered virus samples, 10-fold serial dilutions are recommended; otherwise, 2- to 5-fold serial dilutions are used. Unlike acute infection in which infectious virus can be directly assayed by the plaque-forming ability, latently-infected tissues/samples of γ-HVs do not usually contain detectable preformed infectious virus, instead, viral DNA is maintained as a circular episome with few genes expressed6,7. In this case, the viral latency load can be determined by the frequency of ex vivo reactivation of the virus from in vitro explants of latently-infected cells onto a permissive indicator cell culture (e.g. Vero cells)8. To this end, single cell suspension of infected tissues is prepared, counted, and plated onto monolayers of susceptible cells, which are then overlaid with plaque assay medium. In this protocol, we have described how to prepare single cell suspensions of spleen for IC assay to measure the amount of latent virus that has the ability to reactivate per spleen or per population of splenocytes4. Since only a small population of splenocytes is latently infected, we usually prepare serial low-fold dilutions of splenocytes suspension for infectious titer testing. Extreme caution must be taken during the entire procedure to avoid harsh pipetting or vortexing cells. It is important to note that explanted B cells from spleen generally show poor viability9, which might affect the efficiency of ex vivo reactivation. Any gene that improves the survival of latently infected cells could indirectly facilitate the efficiency of the ex vivo reactivation of the virus. Compared with plaque-forming and IC assays, qPCR provides an effective means to accurately quantify lymphocytic γ-HVs in infected mice10. It is particularly useful for a virus with poor plaque-forming ability due to its minimal cytotoxicity to Vero or other indicator cells, and can be applied for both acutely and chronically infected samples. A standard curve is necessary and important for accurately quantifying viral genomes. We developed γHV68 standard curves based on the ORF56 gene amplification, utilizing a bacmid clone containing the γHV68 genome8. qPCR reaction is extremely sensitive being able to detect even a few copies of viral DNA per qPCR reaction, far beyond the limits of plaque assay. Precautions however must be put in place to avoid cross-contamination between samples while including uninfected samples as necessary negative controls for each reaction. The specificity of qPCR reaction can be a serious issue particularly for infected tissue samples, since enormous amount of cellular DNA may affect the signal of virus-specific amplification. This however can be detected by melting curve analysis for nonspecific amplified products. In naturally infected splenocyte populations, the frequency of γHV68-bearing cells can be very low. In this scenario, as a complement to the qPCR analysis using quasispecies DNA, limiting-dilution PCR (LD-PCR) provides an alternative advantage to evaluate the frequency of viral genome-bearing cells11,12. Briefly, γ-HVs-infected lymphocytes are serially diluted. DNA extracted from these cells is to be used for a sensitive nested PCR assay, which can detect the presence of single-copy viral DNA in individual samples. A combined analysis of limiting dilution and qPCR will reveal both the frequency of latently infected cells and the viral latent DNA load. Notably, IC assay cannot be used as a stand-alone method to measure viral latent load, due to the fact that it does not distinguish between reductions in viral latent loads versus a failure of the latent virus itself to reactivate. As a further measure of viral latency, qPCR is used to quantitatively evaluate the viral genome copies in infected tissues. A correlation between reduced viral genome loads and infectious center titer would suggest a latency defect of the virus. In contrast, a disparity between high viral genome loads and low latent viral titer would argue that although the virus is capable of maintaining a latent viral DNA pool, it is unable to efficiently reactivate from latency. In conclusion, the methods described in this protocol also have general applicability to herpesviruses other than γHV68, for which the targeted cell types and viral genomic sequences are available and allow the unequivocal evaluation of distinct life cycles in vivo. It can also be used to address the biological role of specific virulence factors in the context of mouse infection. For instance, by comparing the replication of different viral Bcl-2 mutant γHV68 with that of wild-type γHV68, our recent work8 allows us to determine which function of vBcl-2 (e.g. apoptosis, autophagy, or both) contributes to the in vivo behavior of this virus in acute and chronic infection in mice. Thus, they also represent important tools to dissect the virus-host interactions during infection. The authors would like to acknowledge the technical advice and support from Ren Sun (University of California, Los Angeles) and Seungmin Hwang (Washington University). This work was funded by the Baxter Foundation, National Institutes of Health grants (R01 CA140964 and R21 AI083841 to C. Liang). Damania, B., Choi, J. K., Jung, J. U. Signaling activities of gammaherpesvirus membrane proteins. J. Virol. 74, 1593-1601 (2000). Stevenson, P. G., Efstathiou, S. Immune mechanisms in murine gammaherpesvirus-68 infection. Viral. Immunol. 18, 445-456 (2005). Flano, E., Husain, S. M., Sample, J. T., Woodland, D. L., Blackman, M. A. Latent murine gamma-herpesvirus infection is established in activated B cells, dendritic cells, and macrophages. J. Immunol. 165, 1074-1081 (2000). Sunil-Chandra, N. P., Efstathiou, S., Nash, A. A. Murine gammaherpesvirus 68 establishes a latent infection in mouse B lymphocytes in vivo. J. Gen. Virol. 73, 3275-3279 (1992). Simas, J. P., Swann, D., Bowden, R., Efstathiou, S. Analysis of murine gammaherpesvirus-68 transcription during lytic and latent infection. J. Gen. Virol. 80, 75-82 (1999). Ganem, D. KSHV and the pathogenesis of Kaposi sarcoma: listening to human biology and medicine. J. Clin. Invest. 120, 939-949 (2010). Wen, K. W., Damania, B. Kaposi sarcoma-associated herpesvirus (KSHV): molecular biology and oncogenesis. Cancer. Lett. 289, 140-150 (2009). E, X. Viral Bcl-2-mediated evasion of autophagy aids chronic infection of gammaherpesvirus 68. PLoS. Pathog. 5, e1000609-e1000609 (2009). Marques, S., Efstathiou, S., Smith, K. G., Haury, M., Simas, J. P. Selective gene expression of latent murine gammaherpesvirus 68 in B lymphocytes. J. Virol. 77, 7308-7318 (2003). McCausland, M. M., Crotty, S. Quantitative PCR technique for detecting lymphocytic choriomeningitis virus in vivo. J. Virol. Methods. 147, 167-176 (2008). Weck, K. E., Kim, S. S., Virgin, H. I., Speck, S. H. B cells regulate murine gammaherpesvirus 68 latency. J. Virol. 73, 4651-4661 (1999). Weck, K. E., Kim, S. S., Virgin, H. I., Speck, S. H. Macrophages are the major reservoir of latent murine gammaherpesvirus 68 in peritoneal cells. J. Virol. 73, 3273-3283 (1999).